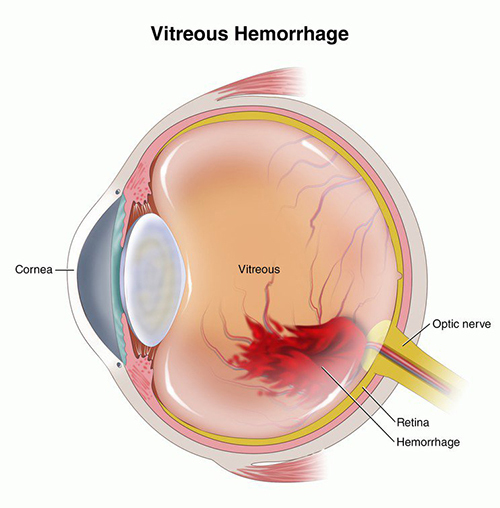 Vitreous hemorrhage is characterized with a sudden change in person's vision. It results from blocking of light moving through vitreous to the retina. The hemorrhage occurs in front of retina in the eyes's posterior section. It may result due to aneurysm of a blood vessel, a retinal tear, a retinal detachment, trauma and a new blood vessel (neovascularization) of the eye. Other disorders which can also result in Vitreous hemorrhage includes hypertension, sickle cell anemia, diabetes and carotid artery disease. People who are diabetic become more prone to it, as it leads to the growth of new blood vessels inside the eye. These vessels are still weak and begin to bleed easily. So, blindness becomes a major issue among patients who are diabetic and can occur at any age. Treatment for vitreous hemorrhage depends on the cause and severity of the disease. In case of retinal detachment the doctor may advice for surgery. Its best to avoid smoking as it can lead to life threatening eye problems like cataracts, damage to optic nerve, macular degeneration etc. One must always select the right pair goggles to guard the eyes from sun's harmful ultraviolet (UV) rays. Excess of exposure leads to cataracts and macular degeneration. Your shades must be able to block 99% to 100% of both UVA and UVB rays. Polarized lenses are best known to reduce glare while you driving or waling in sun. People wearing contact lenses should also wear sunglasses for extra protection. Try to wear safety glasses or protective goggles while working in an environment which is hazardous and airborne materials. While playing ice hockey, racquetball or lacrosse chances of eye injury are more. It's advised to wear Helmets with protective face masks along with sports goggles to guard your eyes. When you feel your eyes are dry, blink more. Give enough to your eyes every 20 minutes. In case of headache or itching do consult a good doctor. Arjuna capsules are prepared with the pure extract of herb Arjuna (Terminalis arjuna).The bark of the tree contains natural alkaloids, which are very useful to cure the bleeding. Benefits: It helps to control the bleeding, hence these capsules are effective in controlling bleeding. These capsules help to remove the blockage in the vessels. The Arjuna capsules act as an anti-oxidant, anti-inflammatory and analgesic. Dosage: 1 capsule, twice daily. Bilberry capsules is obtained from pure herb named as Bilberry (Vaccinium myrtillus). This herb is packed with anti- oxidant properties and also helps to strengthen the muscles of eyes. It is also good to improve the blood circulation in all parts of body. Dosage: One capsule two times in day with milk or water after meals. It helps to restore the balance of Pitta (Fire energy) in the body. These capsules consists of calcium compounds and herbs. Jawar Mohra Pishti Compound, Kamdhudha Ras Compound, Mukta Pishti (Pearl) Compound Parval Pishti (Coral) Compound, Akik Pishti (Agate) Compound, , Giloy Satva (Tinospora cordifolia). Benefits: Our body consists of three energies Vata, Pitta and Kapha. Pitta Balance capsule helps to balance the aggravated pitta dosha in the body. It provides cooling effect to the body. Pitta Balance helps to restore the balance of fire energy in the body leading to excellent results in bleeding and burning sensation. 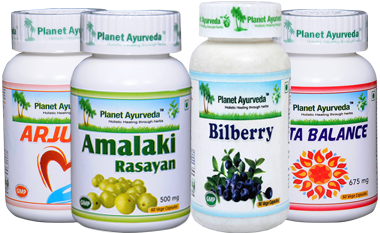 Planet Ayurveda offers amalaki rasayan in the form of capsules and free from any colors, preservatives and chemicals. Amalaki rasayan is prepared from the pure extract of herb Amalaki (Emblica officinalis) with a specific process. This herb commonly called as Indian gooseberry and has great medicinal importance in Ayurveda. This herb is packed with hematogenic properties and helps in production of red blood cells. Dosage: 1-2 capsules two times in a day with plain water after meals.